You save about 10% compared to a single order! Cost per day: A 5 kg cat needs about 250 g of meat per day. In terms of our packs, this is equivalent to €0.83 per day. This is a value pack for your grown, mature cat! Keep the right dietary balance in mind for the mature cat. 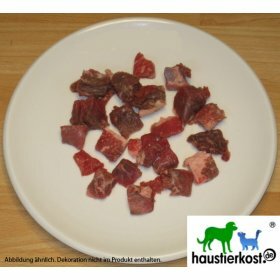 Our special provisions pack therefore includes nine different types of meat in order to provide your cat with important nutrients such as proteins, fats, minerals, vitamins and fibre. Variety guaranteed! All products are coarsely minced except for Cat Feast/Puppy Plus, which is finely minced.